So, you've set up Google Analytics for your Etsy store, toured Etsy's Shop Stats, and had a few days to look around at all the features. By now you're probably wondering how we're going to use all these tools to increase your Etsy sales! Today we're going to talk about using campaign tags to track the value of your social media links and online advertising. Identifying the best campaigns will not only save you time (and advertising cash! ), it will help you concentrate your promotional efforts on the audiences most likely to buy. Everything after the codeitpretty.com in that link is a campaign tag component. 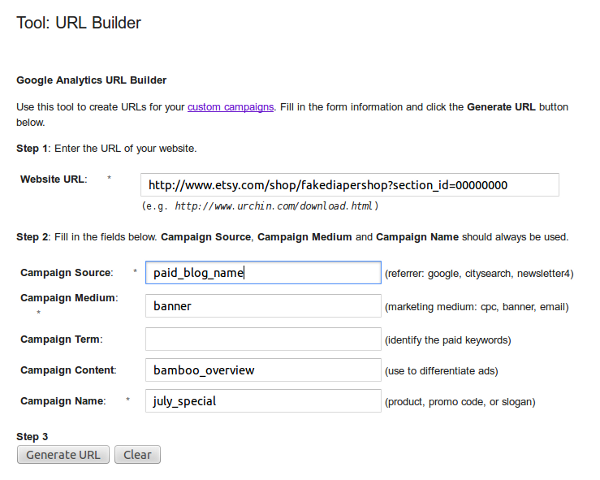 Campaign tags make it easy to determine which of your links brought the most shoppers to your Etsy store. When Should I Use Campaign Tags? 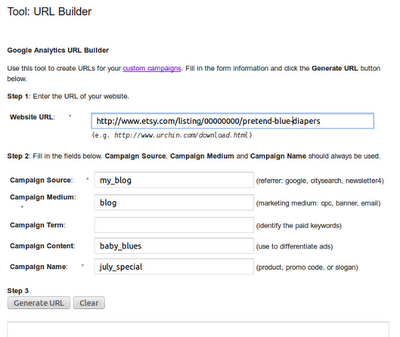 Campaign tags are handy any time you want to track the response to a link or group of related links. Let's use a hypothetical shop campaign as an example. Pretend you sell organic cloth diapers, and you want to promote a 15% off special on all your bamboo diapers through the month of July. We'll call that your july_special campaign. You're going to promote that special on your blog, on Twitter, on Facebook, in your email newsletter, and on a banner ad on another blog. Phew! That's a lot of links. 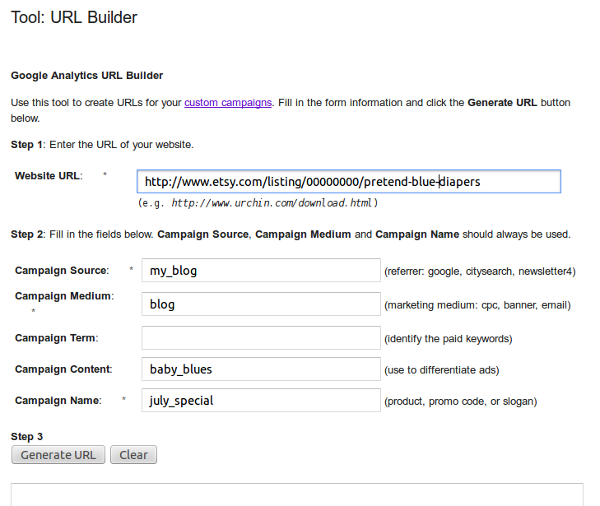 Use campaign tags and you can track response to those links at a glance in Google Analytics. Google makes it super easy to create campaign links. Just go to the URL Builder and fill in the blanks. Exactly what to put in those blanks takes a little planning, and we'll do that now! There are 5 campaign fields you can fill in, but only 3 are required (source, medium, and name). We've filled out this form with my_blog as the Campaign Source (since you'll be using this link on your own blog), blog as the Campaign Medium, baby_blues as the Campaign Content since the link promotes baby blue diapers, and july_special as the Campaign Name. We've skipped Campaign Term because it's designed for use with keyword advertising, and doesn't apply here. To make more links from your blog, just change the Campaign Content field to reflect the content of each of your promotional posts, for example, pink_diapers, yellow_diapers, green_diapers. This time we've changed a few things: the link goes to the bamboo diaper section in your Etsy shop, instead of a specific diaper. We've changed the source to "paid_blog_name" (in real life, use the blog's real name!). We've changed medium to "banner", since it's a banner ad. We've changed content to "bamboo_overview" since the ad shows an overview of your bamboo diaper section. The campaign name stays the same since it's still part of your july_special campaign. By the way, you don't need to set up campaign links for your Adwords advertisements when you use Adwords' auto-tagging feature, which Google strongly recommends for Adwords. Using this pattern, you can create tagged links for all of your promotional channels so you can determine which gets the biggest response. Pinterest has recently started removing campaign tags from Pins, so campaign tags no longer work for Pinterest. Bummer, I know! The use of most campaign links is self-explanatory; you just create the link and use it in your post, tweet, or ad. But with Pinterest, you have to create the campaign URL, visit that URL, and then create a pin from that URL. An extra step, yes, but it's worth it! The day after your first campaign links have run, go to Traffic Sources > Sources > Campaigns. You'll see a summary of your campaigns and the visits they brought to your store. Even if you've never set up a campaign before, you'll find some campaigns listed in here already. Don't worry, that's normal! 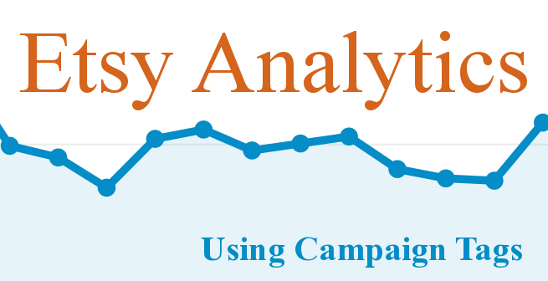 Unknown campaigns will appear in the analytics for any Etsy shop. 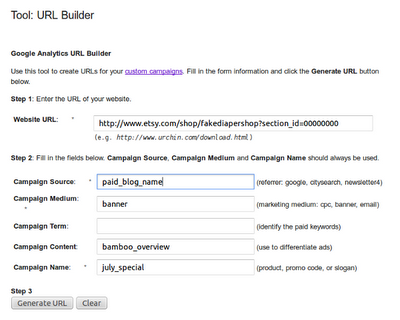 Google Analytics will report every campaign tag that lead to a visit to your store, including campaigns run by Etsy. Campaign in general: When you land on the campaigns page, you'll see a list of your campaigns and a breakdown of the visits they sent. In the diaper shop example, you'd see july_special listed as a campaign. Links in specific: Click on the campaign name and you'll see the visits broken down further by Source/Medium. Using our diaper shop example, you'd see my_blog, paid_blog_name, and the names you gave to social media channels and your email newsletter. At a glance, you can quickly determine which links in your campaign brought the most traffic to your shop. Ready to move on? Read Etsy Analytics: Putting it All Together.